Following the Christmas Day bombing in the capital of Abuja, Nigerian President Goodluck Jonathan met with the Sultan of Sokoto, the spiritual leader of the country's 70 million Muslims. 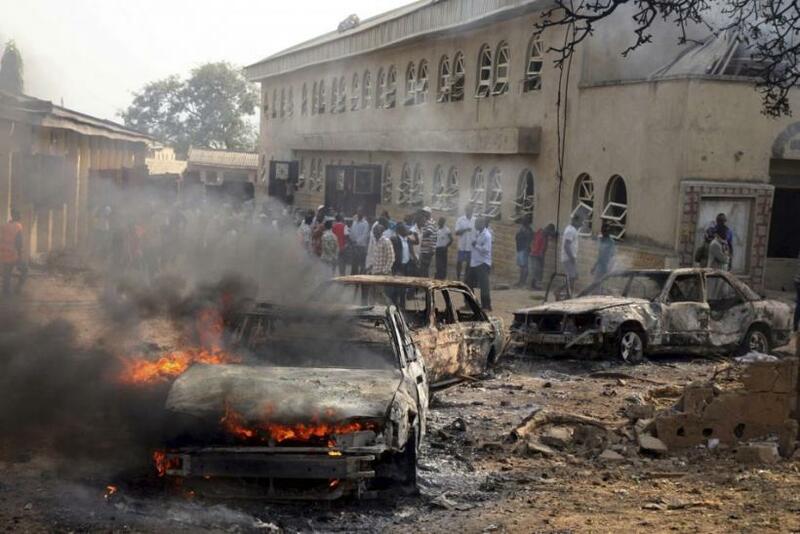 The attack, which occurred during mass at St. Theresa's, a Catholic Church in the Abuja suburb of Madalla, has been blamed on radical Islamic sect Boko Haram. At least 35 people were killed in the bombing on Sunday. Tuesday's meeting between Jonathan, a Christian, and the sultan, Muhammad Sa’ad Abubakar, lasted about an hour. The two leaders discussed how to curb the increasingly deadly wave of interreligious violence sweeping Nigeria, and while they did not agree on any specifics, the talks could lead to increased dialogue in the country, according to Nigeria's PM News. Currently, Islam and Christianity are equally split as Nigeria's two main religions, with most Muslims living in the north of the country and most Christians in the south. This divide has been the source of significant tension in the past, and Boko Haram has been able to thrive in such an environment. Most of the group's attacks are in the northern states already under sharia law, but Boko Haram has begun moving southward. Additionally, the Christmas attack, which was preceded by a similar attack last Christmas, is a departure from Boko Haram's traditional government targets, as well as a sign that the sect is serious in its quest to make Nigeria a Muslim nation. Despite that, the sultan insisted that there isn't a religious conflict occurring in Nigeria. “It’s a conflict between evil people and good people. The good people are more [numerous] than the evil ones, so the good people must come together to defeat the evil ones, and that is the message,” Abubakar said after the meeting. Jonathan's national security adviser, Andrew Owoeye Azazi, who is a southern Christian, added that any fighting between Christians and Muslims in response to Boko Haram's actions would only damage the nation further. “We are Nigerians. I don’t see any major conflict between the Christian community and Muslim community. Retaliation is not the answer, because if you retaliate, at what point will it end? Nigeria must survive as a nation, he told reporters. Since its founding around 2009, Boko Haram has been a relatively slapdash operation without much group cooperation or leadership, according to experts. However, with some analysts now suspecting that Boko Haram is making connections with other African Islamic militant groups, a new chapter in the sectarian saga in Nigeria could be beginning. It is now assumed that al-Qaida played some role in the August bombing of a United Nations building in Abuja, although the extent of the group's link to Boko Haram isn't clear. One of the suspects behind the U.N. bombing, which killed more than 20 people and wounded 73, is believed to have come to Nigeria from Somalia, where Nigerian police say he trained with al-Shabab, Somalia's al-Qaida backed rebel group. The man, identified as Mamman Nur, reportedly went to Nigeria to assist Boko Haram with the attack in Abuja. In November, Boko Haram spokesman Abu Quqa confirmed that Boko Haram and al-Qaida were cooperating, although he didn't elucidate to what extent. It is true we have links with al-Qaida,” Quqa told Nigerian newspaper The Nation. “They assist us and we assist them. Any Muslim group that is struggling to establish an Islamic state can get support from al-Qaida if they reach out to them. Additionally, even before the bombing, U.S. officials had identified individual links between Boko Haram and al-Qaida in the Islamic Maghreb, a fundamentalist militia spread across Algeria, Morocco, Tunisia and the Sahel nations. The supposed al-Qaida connections has worried U.S. Rep. Patrick Meehan (R-Pa.) who told the House of Representatives subcommittee on counter-terrorism that Boko Haram's connections make them a direct threat to the United States. Boko Haram is planning attacks against the homeland. Lack of evidence does not mean it cannot happen, Meehan said earlier this month. Meehan's comments are likely overblown: Boko Haram has shown no interest in attacking anywhere outside of Nigeria.